"Guidecraft began in 1964 in a small woodshop, producing 10 items. The company was purchased by the owner's son in 1995, who has continued to develop the line, which now includes over 580 educational toys and furnishings. Our size has changed, but our mission remains the same; stay true to the tradition of smart, beautifully crafted wood products, which allow children's minds and imaginations room to truly wonder and grow." 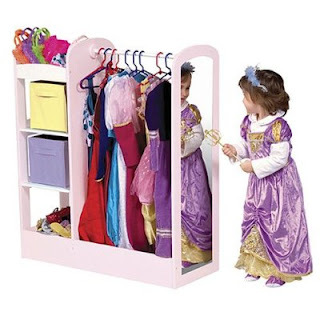 Great for the classroom, nursery school or home, the See and Store Dress up Unit features three storage units on one side for toys, shoes and dramatic-play items; a deep cottom with sides; a 1/2" diameter hardwood dowel for hanging clothes and costumes; and an acrylic mirror for dramatic play. Baltic birch construction with a clear acrylic top-coat guarantee years of use. The directions were very straight forward (much appreciated), and the assembly only took about an hour from start to finish! The quality to this piece is visable upon first glance. We have so many dress up costumes, shoes, and accessories, it can become a mess, and on many occasions the kids can't even find what they are looking for because of where the dress item's were stored (in a tote container). This is where the See and Store Dress Up Center has now saved me! We have all of the costumes hanging, the accesories are organized in the included bins, and the dress up shoes fit nicely on the bottom shelf. After they are all dressed up, they have a great full size mirror on the side of the dress up center to check out their new look! I was so excited to reveal this great new addition in my daughter's room to her! The princess looked like she just might pass out in excitement when she got her first look! This wonderful piece of funiture allows my children to express who they are, and keep everything organized...what more could a mom ask for!? My thanks to Guidecraft for providing the product for review. Leave a Comment~ Which item from Guidecrafts 2010 Online Catalog would you love to have for your little one? The Comment is considered your entry. Entry to this giveaway ends at 12pm PST JUNE 18, 2010. Winner's are chosen randomly through random.org. The winner will be announced on the top of this post, and contacted through email. The winner will have 48 hrs. to respond or another winner will be chosen. It's so hard to pick just one thing! I really like the Jr. Roll Top desk though...I could store all his art supplies and have him set up in his own little space! I like the media carousel. I like the playoffs collection desk. I LOVE the white Roll top desk!!! That is sooo cute! I would love the classic white table and chairs. I would love a table and chair set for my 2 year old! i like the guidecraft Nordic Rocker. I love the Rainbow Blocks Original! Oh my goodness!! This is exactly what I've been envisioning for my girls and their crazy amounts of dress up clothes strung everywhere! I didn't know this even existed! I would definitely want this OR the dress up carousel is great too! Requested Guidecraft Facebook Fan Friend. I entered the Kangaroodle Giveaway! I entered the Flo TV giveaway! Entered the Hayneedle Sandbox giveaway. Entered the Frecklebox Canvas Wall Art giveaway. I like the Mission Table & Chairs Set. I love the Kitchen helper and the art tables.